EBooks on Demand is a Cardiff University trial of Patron Driven Acquisition or PDA which will run from Thursday 6th March for a limited period. This is a method of allowing library users to create a library collection that is relevant to them. Librarians select the range of materials included in Librarysearch, after that the users determine which eBooks are rented and which are eventually purchased from University Library funds. During this trial, there will be an additional range of eBooks on Librarysearch which you will be able to rent for one week, free of charge. This will include access to over 25000 eBooks published in relevant subject areas between 2011 and 2014 provided by the University’s main eBook supplier Dawsonera. When you have found an eBook that you want to read there are 2 options available – 5 minute preview and Rental. 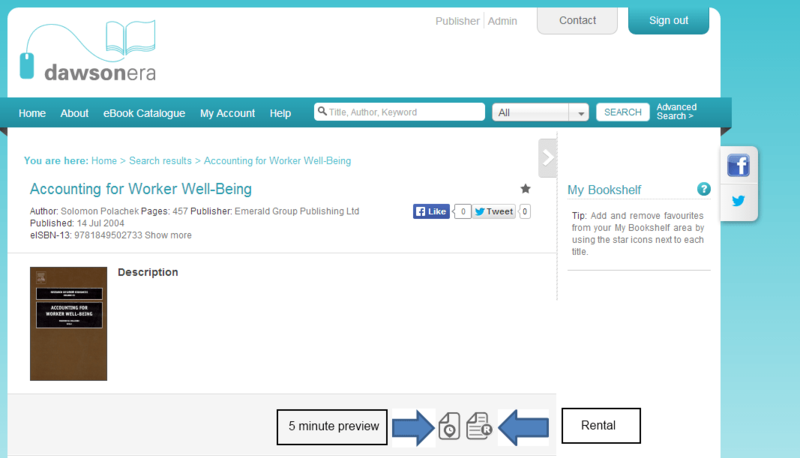 You can use the preview option to check the books suitability before you decide to rent the book. 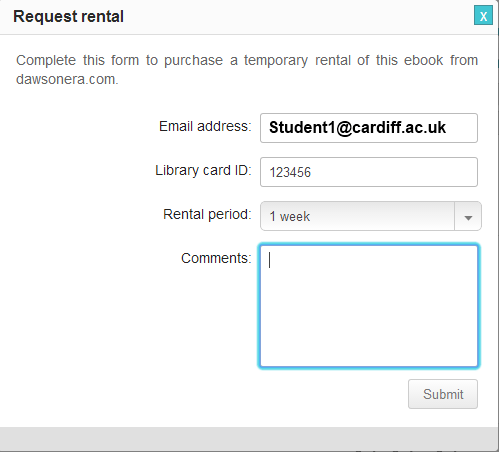 When you click on the Rental button you will see a pop up box which asks for your Cardiff University e-mail address and barcode from your ID card. Click Submit. You will be able to read this book for one week, either via the email link sent to you, or by going to the ‘My Accounts’ section on the Dawsonera site and clicking on ‘Rentals Available’. How do books end up being purchased for the library? Books in the rental scheme can be rented on up to two occasions, a third rental request by any user will cause the book to be purchased from library funds. After purchase all users can then access the eBook from Librarysearch in the normal way. This entry was posted in Ebooks and tagged ebooks on March 3, 2014 by Lindsay Roberts.